Mark Rothstein… Elected into the National Fitness Hall of Fame (2011), Mark has established two World Record for endurance rope jumping of more than 22 hours and 36 hours. Since the 1980’s, Mark has toured the United States and abroad performing more than 12,000 live shows to more than 6,000,000 people. The inspirational theme of Mark’s work and the legacy which he nurtures each day is to exemplify impeccable integrity; stay fit through consistent exercise and work each day to build a virtuous life. 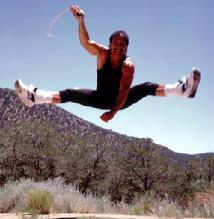 Two Million Miles with his Jump Rope… Mark created a grass roots fitness program in 1981 (World of Rope Jumping) by integrating his skill set as a performing pro-athlete, educator, entertainer and role model. Always and today, Mark’s powerful performances are based on his electrifying rope jumping exhibitions and building positive character. Along his journey now more than 30 years- Mark has personally driven to each and every show by criss-crossing the highways, bi-ways and rural routes of America… now more than 2,000,000 miles! Guinness World Records… Inspired by Jack LaLanne, Mark established his first world record (1989) by rope jumping continuously for more than 22 hours. He followed with his second world record (1990) for rope jumping continuously more than 36 hours. During Mark’s 36 hour rope jumping marathon he completed more than 259,000 revolutions with his jump rope. Everlasting Tour… Mark’s annual tour presently consists of 175 days on America’s roads, personally driving 55,000 miles to perform more than 350 inspirational seminars and shows. Endearment… Mark shall forever cherish the personal telephone calls from Mr. La Lanne congratulating him on each of his World Records, as well as the hand-written letter from Mrs. LaLanne in which she congratulates Mark -and thanks him- for dedicating his National Fitness Hall of Fame Induction to the memory of Jack.